Who knew when I was a little boy; dreaming of owning a Barbie doll, that one day in the distant future there would be a doll invented just for me? Billy was created by artist John McKitterick and marketed in the United States by London-based Totem International as “the first out and proud gay doll” although that distinction actually belongs to Gay Bob, introduced in 1977. McKitterick created the doll based on sketches he drew while living in London. After a successful limited-edition run of 1,200 dolls created to benefit an AIDS charity, McKitterick decided to mass market his creation…. It was introduced in a number of versions based on stereotypical gay characters, including Sailor Billy, Cowboy Billy, Master Billy and San Francisco Billy. 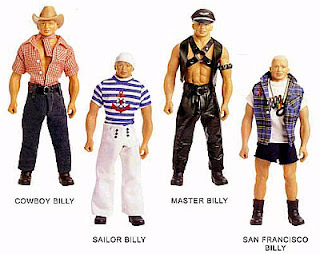 Other dolls in the Billy line include Carlos, Billy’s Puerto Rican boyfriend, and Tyson, their African American friend. 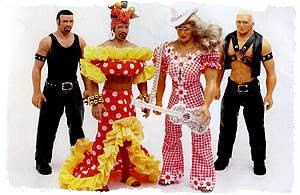 Billy and Carlos donned drag in 1999, with Billy dressed in a gingham checkered pantsuit as “Dolly” and Carlos as “Carmen” in a polka dot outfit reminiscent of those worn by Carmen Miranda. 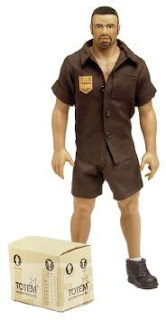 In 2001, a Billy doll wearing a brown uniform with a patch reading “BPS” (for Billy’s Parcel Service) was introduced. Note: “BPS” Billy is my personal favorite. Hubba-hubba! For me, the most hysterical feature of the Billy doll collection is that they’re anatomically correct…. I seriously think they should have named him….Woody.